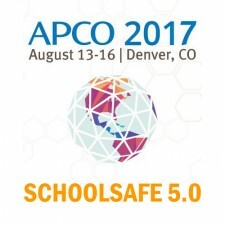 DENVER, Colo., August 18, 2017	(Newswire.com) - SchoolSAFE Communications unveiled its SchoolSAFE 5.0 school safety network solution this week at APCO 2017 in Denver, the company announced today. Presentations to law enforcement and 911 agencies focused on features and benefits that better protect students, teachers, school staff, and responders through newly-enhanced interoperable communications in schools. Because of the required range and necessity for reliability, response agencies communicating by radio are typically equipped with highly advanced radio systems that are unable to directly communicate with the less complex radio systems used by organizations such as schools. However, no matter the type of emergency situation, the ability to provide accurate and timely information by those directly affected often results in a more complete and rapid response by emergency responders. This is what prompted SchoolSAFE Communications to develop a system that enables during emergency situations direct communications on a selective and controlled basis between responders and radio-equipped school personnel. Since 2007, schools using the system have added this essential public safety value to their in-school communications systems that they use for everyday operations. A 911 call center is able to control a radio bridge with data packets over an IP network, and select which schools and offices within a school district can directly communicate with selected emergency response personnel. However, during a crisis event, an existing IP network may quickly become overwhelmed due to a dramatic increase in messaging traffic. SchoolSAFE 5.0 solves this problem which is all too familiar in the public safety world. To ensure system reliability, SchoolSAFE 5.0 adds a redundant radio frequency (RF) network that enables the radio bridge to also be controlled by authorized pre-programmed digital radios. Pre-programmed digital radios can also provide digital commands for controlling a physical security feature at a selected school. For example, a command could be used to activate the PA system at the school, allowing responders to address any part of the building or campus. Another example is a command that can be used to activate lights or to activate remote locking or unlocking of entry points to the school or district facility. Each authorized pre-programmed digital radio may have multiple pre-programmed functions that can be executed by a radio user by simply pressing one or more of the control buttons on the radio. Use of these types of digital RF signals is not affected by an IP network which may be slow to react, especially during extended emergency situations. 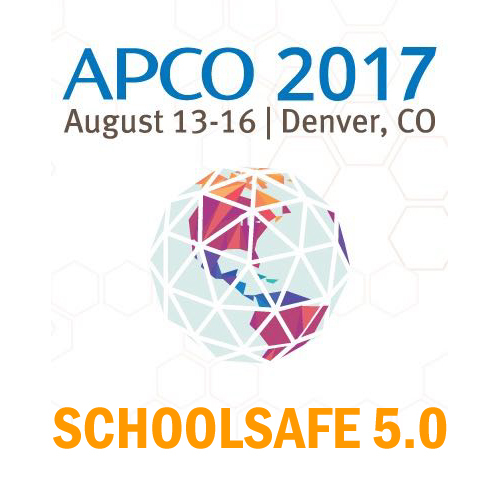 To see these and other SchoolSAFE 5.0 features in action, please visit SchoolSAFE Communications or call 303-900-8930, and ask for a demo or to participate in an upcoming full-scale exercise at a school using the system. The Association of Public-Safety Communications Officials International (APCO International) is the world's oldest and largest organization of public safety communications professionals and supports the largest U.S. membership base of any public safety association. It serves the needs of public safety communications practitioners worldwide — and the welfare of the general public as a whole — by providing complete expertise, professional development, technical assistance, advocacy and outreach. Staying tuned in and connected to their community is how public safety personnel do their jobs and save lives. With schools holding roughly 20 percent of a community's population on any given school day, first responders need reliable communications and real-time intelligence to protect students, teachers, staff, and themselves, which is why during a school emergency they use SchoolSAFE to establish a direct line of dialog with schools and districts. Going beyond the critical 9-1-1 call, SchoolSAFE enables a two-way radio connection allowing emergency services personnel and school officials to talk in real time during an incident. The adaptable SchoolSAFE system can connect any school's existing licensed radio equipment to the radio of a first responder. Plus, the connection can be switched on and off immediately by public safety. SchoolSAFE works with districts to provide user-specific training to teach emergency management skills and form school safety teams. So, if an emergency does happen, whether it affects the whole district, one school, or only a single student, dispatchers can activate the connection, trained school safety teams can connect on the radio, and first responders can arrive on the scene well-informed with the most up-to-date knowledge that could save lives. Stay connected with your community and contact SchoolSAFE Communications to learn more.